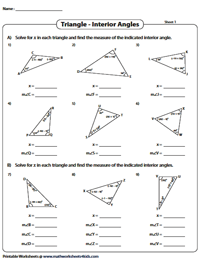 Angles in a triangle worksheets contain a multitude of PDFs to find the interior and exterior angles with measures offered as whole numbers and algebraic expressions. Learn to apply the angle sum property and the exterior angle theorem, solve for 'x' to determine the indicated interior and exterior angles. 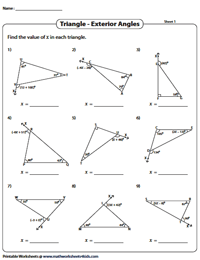 Do the angles form a triangle? 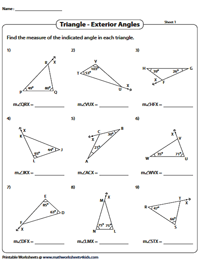 The angle sum property states that the interior angles of a triangle add up to 180°. 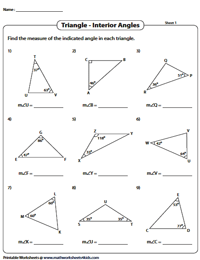 Figure out if the given sets of angles form a triangle by adding them. Respond to each with 'Yes' or 'No'. Subtract the sum of the two angles from 180° to find the measure of the indicated interior angle in each triangle. Applying the exterior angle theorem, add the two opposite interior angles to find the unknown exterior angle of a triangle. The measure of one of the interior angles is presented as an algebraic expression. Set up an equation with the sum of the three angles, equating it with 180° and solve for 'x'. 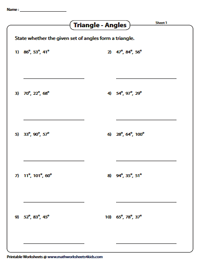 Equate the sum of the two sides with the exterior angle depicted as an algebraic expression. 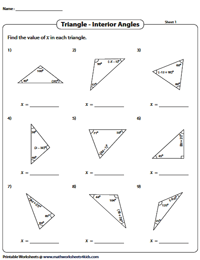 Simplify the expression and find the value of 'x' in this stack of high-school worksheets. Solve for 'x', substitute it in the expression(s) and find the measure of the indicated interior angle(s). The measures of two angles are offered as algebraic expressions in Part A and three angles in Part B. Form an equation with the sum of the opposite angles with the exterior angle, simplify and find the value of 'x'. Plug it and compute the measure of the indicated angle in Part A and the measure of four angles in Part B. 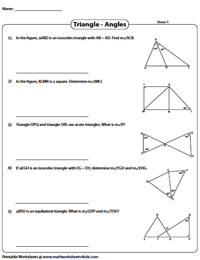 Challenge students with the word format problems involving composite triangles containing right, isosceles and equilateral triangles. 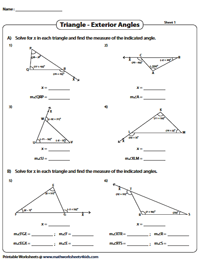 Determine the size of the indicated angles by applying the angle sum property and the exterior angle theorem.